See. Be Seen. Run Longer. Home › Blog › Fleet Feet Scottsdale News › See. Be Seen. Run Longer. Did you know that on average, over 59,000 pedestrians are injured annually by cars? Don’t be a statistic. Studies have shown that runners who wear multiple points of light on their bodies can be recognized by drivers from 6 times further away than those who don't. 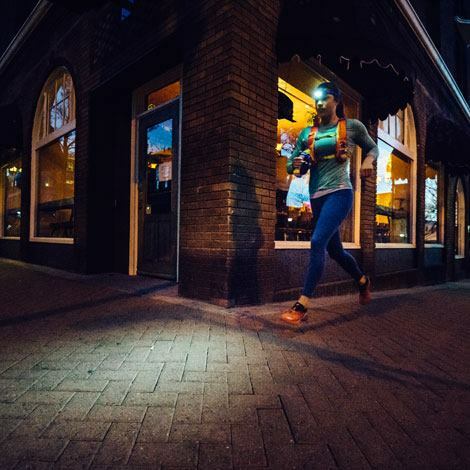 Check out our Nathan Sports LED lights that act as a beacon that allows you to be seen, running-specific handheld flashlights that effortlessly light the path ahead, reflective gear, and our new BlackLight Collection. Adding reflective pieces and active lighting – like our new Nathan Sports headlamps – to your running gear are essential for a safe run at night. Designed specifically for runners, Nathan Sport's lightweight headlamps feature Run-Right Light™ spotlight & floodlight coverage, RunWave™ touch-free setting control and Auto-Strobe™, allowing you to safely navigate those night runs. Read More about what separates these innovate headlamps from the rest below. #FireUpYourRun #RunatNight. Both of Nathan’s new runners’ headlamps feature RunWave™, a touch-free mode control sensor that allows runners to adjust lighting levels while on the run. The Auto-Strobe™ sensor reacts to car headlights and activates the safety strobe mode to communicate runners’ presence to drivers. Halo and Zephyr Fire feature Run-Right Light™, the ideal combination of spotlight and floodlight coverage to ensure strong visibility both at your feet and out in front of you. WATCH THIS VIDEO to see them in action. Come swing by Fleet Feet Sports Scottsdale and ask us about our Nathan Sports Visibility today!